What is the Pigou Effect? The Pigou Effect is a theory proposed by the famous anti-Keynesian economist, Arthur Pigou. It explains a relationship between consumptionConsumer Surplus FormulaConsumer surplus is an economic calculation to measure the benefit (i.e. surplus) of what consumers are willing to pay for a good or service versus its market price. The consumer surplus formula is based on an economic theory of marginal utility. The theory explains that spending behavior varies with the preferences, employment, and economic outputGDP FormulaThe GDP Formula consists of consumption, government spending, investments, and net exports. We break down the GDP formula into steps in this guide. Gross Domestic Product is the monetary value, in local currency, of all final economic goods and services produced within a country during a specific period of time during the times of deflation and inflation. According to Pigou, during deflation, prices are low, which lead to greater real wealth. 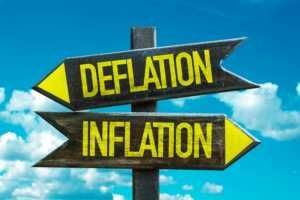 The increased wealth during deflation then stimulates demand, leading to a rise in output and consequently, employment. On the other hand, during inflation, prices would rise, wealth would fall, consumption would fall and hence, output and employment would decline, leading to a drop in aggregate demandMarket EconomyMarket economy definition - a pure market economy is an economic system where there are no regulations and players are free to trade as they please. Also known as the “Real Balance Effect,” the Pigou Effect essentially proposes that any increase or decrease in aggregate demand would be self-correcting. The main argument Pigou emphasizes is the lack of any link between real balances and current consumption in the General Theory of Keynes. This ‘real balance effect’ tries to provide a link that makes the economy more self-correcting to changes in aggregate demand that what John Keynes predicted. 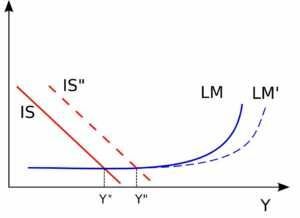 Liquidity trap, in the IS-LM model, is that phase when the economy is operating on a horizontal LM curve. Here, there is zero demand for investment in bonds and people hoard cash due to expectations of events such as war or deflation. Here, monetary expansion fails to increase output. There are very low levels of output and high unemployment. The Pigou Effect proposes a mechanism to escape this trap. According to the theory, price levels and employment fall, and unemployment rises. As price levels decline, real balances increase and by the Pigou Effect, consumption in the economy is stimulated. This creates a fresh set of IS-LM curves, where the IS curve intersects the LM curve above the horizontal liquidity trap portion at a higher interest rate. Consequently, the economy attains the full employment equilibrium. Pigou’s conclusion was that the economy would operate on an equilibrium less than the full employment equilibrium only if the prices and wages were constant. In the IS-LM framework of Keynes, which was formalized by British economist John Hicks, any adverse aggregate demand shock would shift the IS curve leftwards, and the LM curve would shift rightwards because of the simultaneous falls in wage and price level. This is the Keynes Effect. The Pigou Effect, on the contrary, accounts for a fall in the aggregate demand via rising real balances, which raises expenditure via the income effect. The Bank of Japan’s policy of nearly zero interest rates would’ve been successful in addressing the Japanese deflation in the 1990s if the Pigou effect did actually always operate. Constant consumption expenditure in Japan despite falling prices goes against the Pigou effect. Japanese consumers tended to develop a sentiment to delay consumption in anticipation of further declines in prices. Thank you for reading this guide to the Pigou Effect. To keep learning and advancing your career in corporate finance, CFI has developed numerous online courses and resources to teach you what you need to know about economics, finance, and Excel. One of the most important skills for a financial analyst is financial modelingWhat is Financial ModelingFinancial modeling is performed in Excel to forecast a company's financial performance. Overview of what is financial modeling, how & why to build a model. A 3 statement model links income statement, balance sheet, and cash flow statement. More advanced types of financial models are built for valuation, plannnig, and, the art of building an abstract representation of a company and it’s future performance. Learn more about CFI’s financial modeling courses!